A teratogen is a substance known to cause birth defects following exposure during pregnancy. 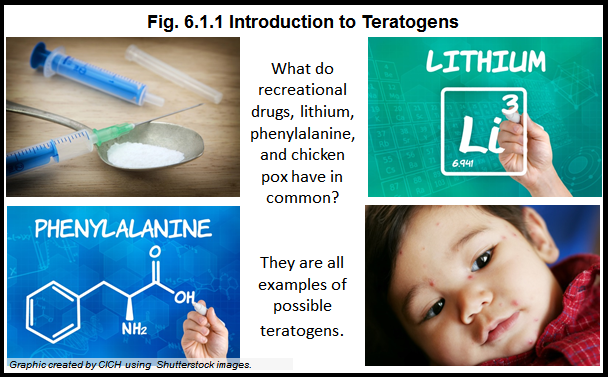 Some teratogens can be drugs (e.g., prescription drugs such as lithium or epilepsy medication or recreational drugs). Certain infections, such as rubella (German Measles) or chicken pox can also be teratogens. The mother can also unknowingly introduce the fetus to teratogens in the womb. For example, in the case of PKU, a mother with PKU herself, who does not follow the prescribed diet, has very high levels of phenylalanine that passes to her fetus through placental circulation and leads to congenital anomalies in the fetus, such as congenital heart disease. It is often geneticists and genetic counsellors who provide counselling for mothers and infants exposed to teratogens.